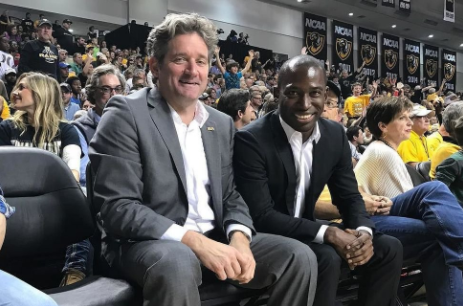 Newly elected Richmond Mayor Levar Stoney celebrated VCU’s win over UMass Saturday with a tweet that had a little too much in common with the Rams’ biggest rival. 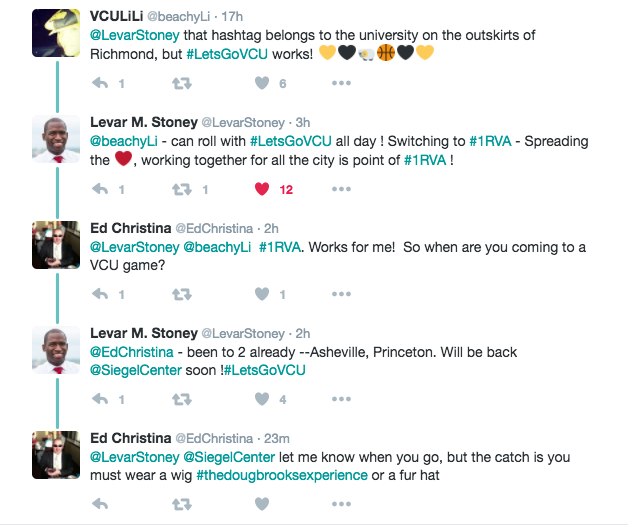 Stoney’s congratulatory tweet concluded with the #OneRichmond hashtag, coincidentally the semi-recently adapted slogan of crosstown rival, Richmond. While Ram fans were appreciative of Stoney’s props, they quickly stepped in to educate the new Mayor of his Ram Nation infraction. Stoney is a graduate of James Madison University, a major football rival of the Richmond Spiders and former semi-rival of VCU on the hardwood. Stoney (right) pictured with city councilman and former mayoral candidate John Baliles at a recent Rams win.